Location The Royal Shrewsbury Hospital and The Princess Royal Hospital, Telford. We wish to identify and train a team of doctors to be excellent clinical teachers with an emphasis on developing skills in simulation, working as part of a team of like-minded enthusiastic individuals in a forward thinking simulation faculty. This post is aimed at applicants looking for a post at ST3+ scale or above. This is a challenging post that will test skills that are not the focus of most clinical training roles, yet are highly relevant and transferable to senior clinical roles. This post encompasses more than just teaching. The successful applicant will take part in various modes of assessment and appraisal with emphasis on designing, developing and delivering simulation education to undergraduates and post-graduates using a variety of methods. You will have a significant role in the delivery of simulation education for years 4 and 5 of the Keele University Medical School Curriculum. This is particularly exciting as the university moves to develop a new curriculum more dependent on a variety of simulated experiences for students in both simulation lab and in-situ experiences. The post holder will also support the whole year teaching component of the fourth year curriculum, including ethics, drug administration, lumbar puncture teaching and pain management again with emphasis on simulation as the educational model. Educational models may include problem based learning, clinical and communication skills tuition, inter-professional education, the use of simulated patients and environments and use of advanced whole body simulation (via use of SimMan 3G). The involvement in the undergraduate curriculum may involve a range of activities, including bedside teaching, clinical skills teaching, communication, ethics and law tutorials, as well as in-course assessment and end of year OSCE examinations for both year 4 and year 5. 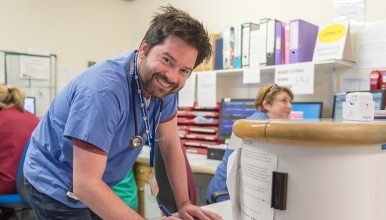 Post-graduate inter-professional whole body simulation is delivered for FY1 and FY2 doctors along-side registered ward nurses in a highly successful local course, receiving out-standing feedback. Trauma team and paediatric emergency simulation training are held frequently in the ED resus room and there is ACCS simulation held for regional trainees in non-technical skills. We are about to commence CMT simulation for regional trainees. Expansion in simulation education is anticipated and planned by the simulation faculty, to include CMT simulation for acute medicine, and advanced emergency medicine techniques including difficult airway and sedation alongside higher specialist training courses. We envisage setting up skills teaching for CMT and ACCS trainees to align with the curricula for each. This will extend to regional teaching days and potentially national conferences. It is envisaged that we will set up an education website for the Trust alongside Free Open Access Medical education (FOAM). We want you to find out more about the department and our hospitals, and we invite you to contact us with any questions you may have or even arrange a visit. Please also take the time to read any supporting documentation to really get to know us.